The Huron-to-Erie Corridor runs from Port Huron, Michigan, to Monroe, Michigan, south of Detroit. Fourteen Michigan water treatment plants from Port Huron to Monroe now have a coordinated early warning system. 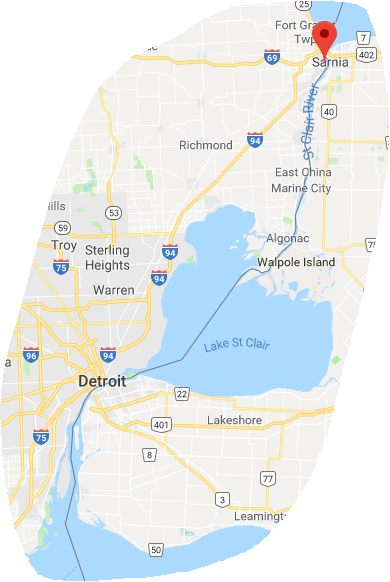 Kelley Karll, an engineer with the Southeast Michigan Council of Governments, says there's a lot of heavy industry and freighter traffic on both the Canadian and U.S. side of the shared waterway, which includes the St. Clair River. She says it's a risk for the three million people who depend on the treatment plants for drinking water. Now, an upstream water treatment plant can immediately warn a downstream plant of a threat. "It could be oil, from an accident, a spill; potentially from Canada, coming downstream," she says. The system will also monitor for toxic blooms that could pose a risk to water intakes, similar to what happened to Toledo's water intake in Lake Erie in 2014. Karll says the project began in the early 2000s but there were problems with the equipment. She says the new equipment is better and easier to maintain and use. It was funded by a $375,000 grant from the governor's infrastructure fund. The water treatment plants that are part of the network are Port Huron, Marysville, St. Clair, East China Township, Marine City, Algonac, Ira Township, New Baltimore, Mount Clemens, Grosse Pointe Farms, GLWA Water Works Park, GLWA Southwest, Wyandotte and Monroe. The western end of Lake Erie, especially near Toledo, is seeing a lot of cyanobacteria this year. It’s been worse, but this year's cyanobacteria bloom is larger than average. And we’re seeing a kind of cyanobacteria (sometimes referred to as blue-green algae) that can produce a toxin. It can make you sick if you swim in it. It can make pets sick. And it’s a problem for water purification plants and drinking water, too. Don Scavia is the director of the Graham Sustainability Institute at the University of Michigan. He’s also an aquatic ecologist. When Lake Erie was considered “dead” back in the 1960s and '70s, these cyanobacteria blooms were a contributing factor.